On March 30, 2016, the 9th plenary meeting of the 13th Presidium of the Supreme People’s Assembly (SPA) of the DPRK convened at the Mansudae Assembly Hall in Pyongyang. Such meetings are routine events taking place annually in the spring. A senior official, usually the Prime Minister or the Minister of Finance, reports on the state budget for the past and current years and announces the cornerstones of economic policy. Thus, while neither the plenum itself this year nor its timing was extraordinary, there were a few noteworthy features that justify taking a closer look at the typically sparse news about this event disseminated by the North’s state media. The weight of income from sources that are explicitly not classified as “central” grows continuously. 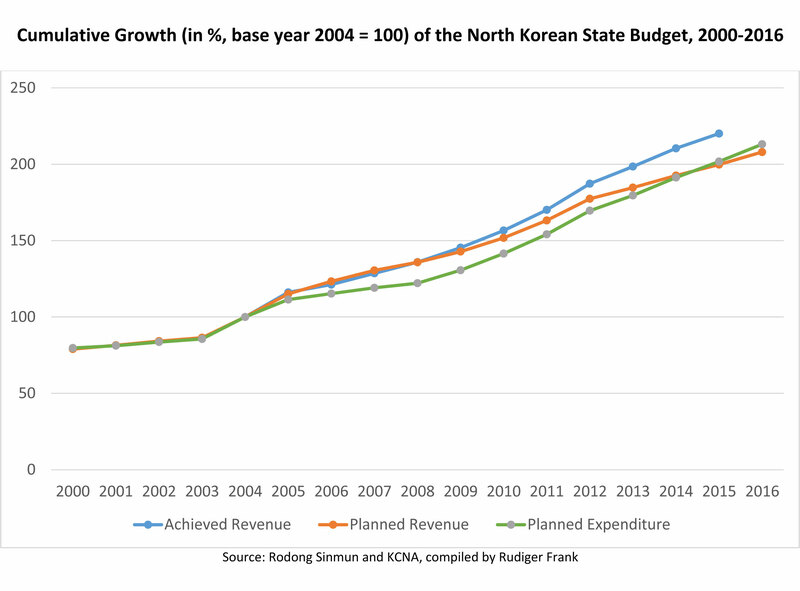 The revenue coming from “central” (중앙) sources is still high, but the slowly-but-steadily growing percentage of the state budgetary revenue coming from “local areas” (지방) is remarkable. It is now 23.2 percent compared to 16.1 percent in 2011, the first time it was reported in the last decade. The term “local” has a double meaning. Technically, it refers to enterprises in the provinces and could perhaps be understood as a euphemism for what used to be called Township and Village Enterprises (TVEs) in China. But according to information I was given during my visits to North Korea, it can also characterize the non-centrally planned part of the economy. It is admittedly a long shot judging only by the budget report, but it would be truly remarkable if almost a quarter of the value produced in North Korea is, indeed, coming from that sector. Moderate growth of expenditure on agriculture implies that no emergency is expected. The 4.3 percent for 2016 is similar to 4.2 percent for 2015, but much less than the 9.x percent in the years 2010, 2011 and 2012. The conclusion would be that the state is satisfied with agricultural production and believes it does not have to make growth one of its top priorities this year. Investment in infrastructure will grow above average in 2016. Extra budget for “capital construction” (기본건설부문) grew from +4.3 percent in 2014 to +8.7 percent in 2015 and now +13.7 percent for 2016. The North Korean media provided no explanation of this somewhat obscure term, but my conversations with North Korean economists indicate that this concerns infrastructure including roads and public buildings. Expenditure on education, another component of what we would call social overhead capital, is also supposed to grow above average in 2016 (+8.1 percent compared to +6.3 percent in 2015). The budget seems to be more or less balanced, i.e. no major external inputs are expected. State expenditure is planned to grow by 5.6 percent in 2016. This is almost the same value as in 2015 (5.5 percent) and more than the growth rate for revenue. North Korea still plans to spend more than it earns, since the gap between the planned growth of revenue and expenditure for 2016 is 1.5 percent. This could indicate the expectation of external transfers or other sources of income to cover that gap, feeding a popular Western narrative of secret or illicit sources of income. However, we should be careful interpreting the official budget figures that way; this income could simply be generated by the over-fulfillment of the plan which was 1.3 percent in 2015-2016. 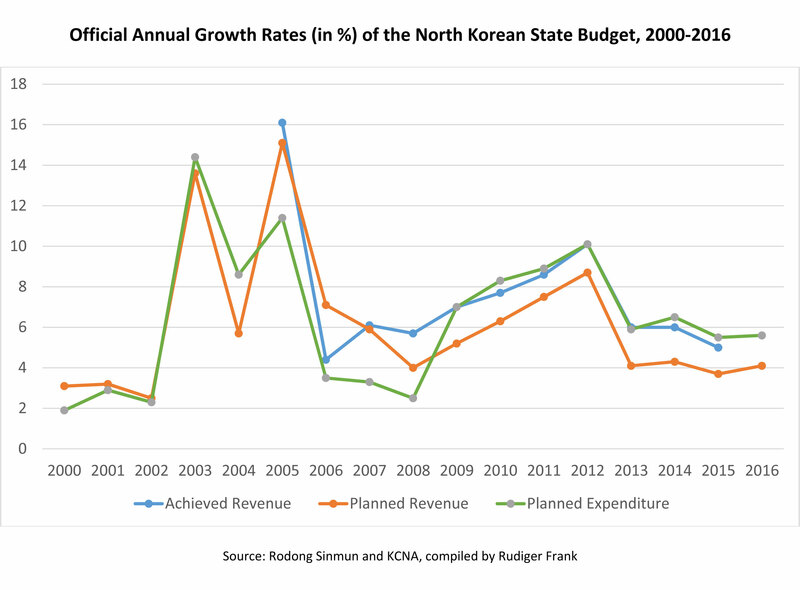 This possibility is supported by graph 1, which shows that the value for achieved revenue has constantly been above cumulative expenditure growth throughout Kim Jong Un’s tenure. The trend of setting lower official growth targets, evident since the emergence of Kim Jong Un, has continued. The growth rate for “achieved” state revenue 2015-2016 was 5 percent, 1 percent less than the year before. This is the second lowest value since 2004. It is not clear whether this is an expression of reduced growth, or a sign of more realistic reporting. This year’s special circumstances are not immediately visible in the budget report. The first-ever Party Congress in 36 years to be held in May will most likely include some new directives on the economy. 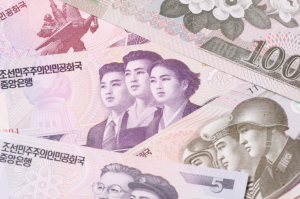 A few weeks ago, new sanctions potentially affecting all of North Korea’s trade were issued, and the Kaesong Industrial Zone, an important source of hard currency, was closed. Considering the impact these events will potentially have on North Korea’s economy, one would expect that they would somehow be addressed or at least reflected at the SPA plenary meeting, for example, in the form of increased or reduced growth expectations or by displaying a defiant “now more than ever” spirit. However, a closer look at the budget report reveals only marginal changes, but no major differences compared with the previous reports. Graph 2 shows the year-on-year growth figures in comparison to the values for the previous years. The state’s official outlook on the economy in 2016 is not pessimistic. The growth figure for planned state revenue in 2016 is 4.1 percent, slightly higher than last year’s figure of 3.7 percent. In other words, the state is slightly more optimistic about the economy than it was in 2015. The Kaesong closure has not affected the state’s expectations of revenue from special economic zones. Revenue from special economic zones is expected to grow 4.1 percent in 2016. This could perhaps be interpreted as a sign of defiance, but the number does not significantly deviate from the figures for 2015 (+3.8 percent) and 2014 (+5.1 percent). I would support an alternative interpretation: that the income from Kaesong has never been part of the official state budget and thus the closure had no effect on these reports. The reduction in official military expenditure is marginal. The planned expenditure for the military in 2016 is supposed to be reduced from 15.9 to 15.8 percent of total expenditure. This has been interpreted by Western and South Korean media as a noteworthy signal. However, a change by 0.1 percent is hardly a major policy change, in particular, since we can expect the real expenditure to be much higher. The military has its own sources of revenue which are, for obvious reasons, not made public. But even if this number is treated seriously, we only see the return to a value that was standard for a long time. The official military budget has been 15.8 percent of the total budget in every year from 2009 to 2012. For 2013, no value was provided; only in 2014 and 2015 was it 15.9 percent of total. The explicit mentioning of “nuclear strike means” (핵타격수단) is unusual for state budget reports but in the context of the bellicose rhetoric of the past weeks can hardly be seen as extraordinary. Reporting this year was subdued even when compared to previous years. Unlike in past years, there was only one article about this event in the news rather than the usual three. This could have been for technical reasons, or the state may not have wanted to divulge more detailed information on the economy before the 7th Party Congress in May. No individual participant was mentioned explicitly. This time, only the general term “rapporteur” (보고자) was used without indicating who actually delivered the budget speech. Pyongyangologists would perhaps suspect a reduced role of the Premier or the Cabinet, or interpret the fact that the budget speech contained a direct quote from Kim Jong Un as that he intends to concentrate all attention only on himself. No report on economic development strategy. In previous years, before the budget report, there was usually a general speech “On the work of the DPRK Cabinet and its tasks.” However, this year, the media wrote only about the budget report itself. This could possibly mean that the more programmatic speech was postponed until the Party Congress in May, or that North Korean media simply did not mention it. The same is true for “organizational matters.” Usually, a few personnel changes are announced during the spring SPA plenary session; however, none of this took place this time around. The hope to be presented with some real macroeconomic data by the North Korean government was, once again, left unfulfilled. There wasn’t even a return to the pre-2002 custom of providing budget figures in North Korean won instead of percentages. We still face a situation where official data on North Korea’s economy is, in many ways, too vague to draw solid conclusions. Nevertheless, the budget report did provide some food for thought and, as usual, for speculation. If I had to single out the three most noteworthy among my twelve observations, they would include the the growing income from “local” sources; the substantial increase in infrastructure investment planned; and the absence of any visible effect of the latest sanctions and the Kaesong closure on budget projections for 2016. If we take the report at face value, which admittedly is a somewhat risky endeavor, it points to a belief by the North Korean government that international punitive measures will not affect the economy. The report also indicates that the part of the economy that produces outside of the plan is growing. At some point it will have reached a size where it becomes essential for the national economy, and thus less likely to be subject to state crackdowns/forced closures, etc. Finally, the systematic improvement of social overhead capital, a policy that included the introduction of an additional year of schooling in 2012, continues. At least from a developmentalist perspective, this is good news.